The single room is a double room for individual accommodation. It offers all the amenities of the double rooms at the hotel. The hotel has 150 suites suitable for families with children. Each apartment consists of living room and bedroom separated by a door. Comfortably furnished and equipped with air conditioning, satellite TV, fridge /minibar type/, kettle, direct dial telephone, Wi-Fi Internet /upon additional payment/, a bathroom with shower, hairdryer. The hotel has 321 comfortably furnished rooms. Each room has a balcony, air-condition, satellite TV, fridge /minibar type/ kettle, direct dial telephone, wireless Internet /upon additional payment/, a bathroom with shower, hairdryer. 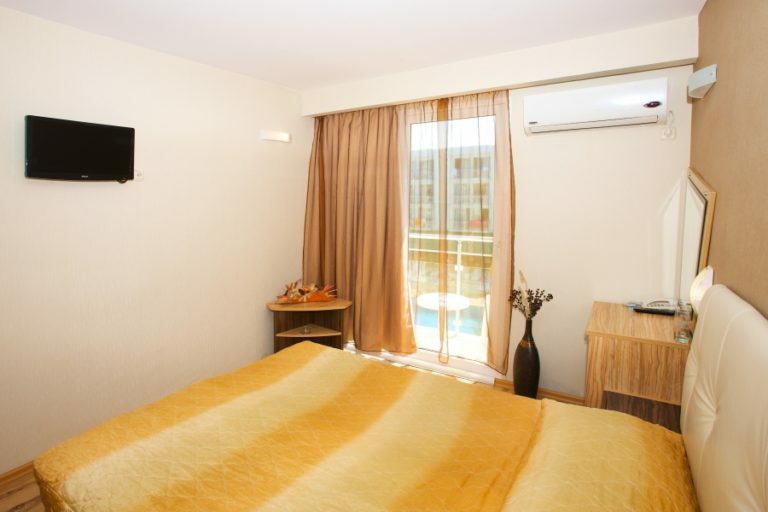 The rooms are furnished with extra bed suitable for third person.